Born in 1929 Jacqueline Hill had set her heart on acting at an early age and was able to secure a place at the Royal Academy of Dramatic Art (RADA). On graduating she played a number of parts in theatre, television and films including, alongside Sean Connery, in one of ABC's television Armchair Theatre plays. On leaving Doctor Who she spent time with her family and only returned to television in the late seventies appearing in Tales of the Unexpected and also returning to Doctor Who as the high priestess Lexa in the 1980 story "Meglos". 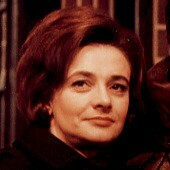 Unfortunately, Jacqueline Hill died in 1993. Barbara Wright was a history teacher at Coal Hill School. It was her curiosity about her strange pupil Susan that made her persuade fellow schoolteacher Ian Chesterton to investigate her home and her mysterious grandfather. Even though she agreed with Ian that they should not follow her home but the fact that Susan was such a mystery meant that she could not stop herself. Like Ian she could not believe her eyes when they enter the TARDIS and find that the room they are in is much larger than the police telephone box they had just entered. At first she was too concerned for Susan to take it all in. Like Ian Barbara found it hard to believe The Doctor and Susan's explanation of the TARDIS and she was convinced that it is all part of Susan's wild imagination. 'Can't you see that all this is an illusion. It's a game that you and your grandfather are playing, if you like, but you can't expect us to believe it'. She was able to get over the initial shock of being captured and transported in the TARDIS much more quickly than Ian was and she was able to come to terms with her predicament a lot faster. Along with Ian she too at first did not trust The Doctor especially when Ian gets an electric shock from a booby trapped console which The Doctor uses to prevent him from opening the TARDIS doors and allowing them both to escape ("An Unearthly Child"). Barbara did find The Doctor annoying at times, especially when he had proved himself wrong and was never slow to tell him so. However, she soon mellowed to The Doctor and like Ian started to enjoy travelling to exotic places and times. She had a fairly open mind and was able to accept the situations that she found herself in, as seen most notably when she learned that the TARDIS crew changed history every time they left the ship - rather than The Doctor’s initial claims that it was impossible to alter history - recognising that The Doctor avoided altering the original outcome of events because it made everything too complicated ("The Time Travellers"). Barbara was by no means the glamorous, mini-skirted screamer that was to become the main role of the female companions of later years. One thing Barbara could always be sure of, though, was the close companionship she had with Ian. It seemed almost certain that Ian and Barbara were made for each other but there was never any sign of any romance between the two of them in the television series (Although Barbara recognised her feelings for Ian after witnessing the death of an alternate version of him created by a flawed time travel experiment ("The Time Travellers"), later asking Ian to marry her when they returned home ("The Eleventh Tiger")). She also had a very compassionate nature and looked out for Susan and was a tower of strength to her. She also was immediately kind to the orphaned Vicki. (Although their relationship suffered a brief setback when Barbara killed Vicki’s pet sand-beast in the belief that it was a dangerous animal). She became a combination of mother and big sister to them both, even once posing as Susan’s mother during a brief stay in 1692 ("The Witch Hunters"). Although she would always offer Susan or Vicki some support, such as when she and Susan were used as cheap labour by a group secretly constructing a spaceship to escape a dying world ("City at World's End") or when she and Vicki were held hostage by a deranged monk who had been programmed with the memories of the First Emperor of China by The Mandragora Helix ("The Eleventh Tiger"), she would always turn to Ian for her own protection. Her outer calmness belied an inner strength, as seen most prominently when the rest of the TARDIS crew were hypnotised by the disembodied brains controlling the city of Morphoton on the planet Marinus, leaving Barbara to single-handedly destroy the brains’ life-support systems ("The Keys of Marinus"), or when she alone managed to destroy the powerful Animus - one of the Great Old Ones - using The Doctor’s Isop-Tope device ("The Web Planet"). Her soft and calm tones became indispensable during the frequent times of tension that they were all faced with, although she wasn’t afraid to shout when required, once berating The Doctor for not appearing to register that she and Ian were their own people after Susan’s departure ("Venusian Lullaby"). Barbara was practical; she demonstrated great maturity and most of the time she could be relied on for her common sense. She could be sensitive and thoughtful but also argumentative and sullen, most notably when arguing with The Doctor when she tried to encourage changes to Aztec culture ("The Aztecs") or when she believed that Ian had been killed (Although the dead Ian was later revealed to be an alternate Ian created by a flawed time-travelling experiment) ("The Time Travellers"). Also Barbara wasn't averse to a bit of fun, enjoying their brief ‘holiday’ in a Roman villa ("The Romans") (Although this was preceded by the crew becoming separated and each believing the others to be dead ("Byzantium!")). She however, did find it difficult at times not to get involved and to try and change history for the better. This is well demonstrated in the story "The Aztecs" where The Doctor tells her 'You can't rewrite history. Not one line! Barbara one last appeal: what you are trying to do is utterly impossible. I know! Believe me, I know! ', although she later accepted The Doctor’s reasons for lying when he revealed that he could change history but chose not to in order to avoid complications. Being a history teacher served her well during the historic adventures and a number of times she relished in the opportunity to meet characters that she had only read and taught about. This was clearly demonstrated in "Marco Polo" where she enjoyed meeting the great explorer during his trek across China; she even received a gold bracelet from Emperor Nero during a trip to Rome ("The Romans"), although she lost it during their trip to Vortis when the Animus used it to control her mind ("The Web Planet"). Even so despite the many varied locations the TARDIS took her to, like Ian, Barbara took advantage of a Dalek time machine and persuaded The Doctor to make it possible for them to use it to return home to 20th century London. Despite arriving back two years after she had left Barbara was just relieved to be back in familiar surroundings again ("The Chase"). Shortly after their return to Earth, Ian and Barbara were abducted by an alien race and trapped in a psychic prison that reverted them back to just before they left Coal Hill School to follow Susan, until they were rescued by the Eleventh Doctor after their prison’s psychic energy caused chaos on a ship that he had just landed on ("Hunters of the Burning Stone"). Although Barbara was briefly held hostage by their enemies, the two joined The Doctor in investigating the origins of their psychic prison and the metal that made it, eventually learning that a race known as the Prometheans had abducted Ian and Barbara due to their role in influencing the Tribe of Gum ("An Unearthly Child" aka "100 000 BC"), the Prometheans attempting to establish themselves as gods before the TARDIS crew inspired the Tribe of Gum to seek their own destiny. With The Doctor having used the Prometheans’ equipment to impose mental barriers on humanity that would prevent the Prometheans influencing them, using the TARDIS as a protective image in the human subconscious, he took Ian and Barbara home, subsequently serving as Ian’s best man at their wedding, assuring his first companions that he valued his time with them as they had helped him become a better person, citing such moments as Ian’s compassion for a caveman when The Doctor had been willing to kill him. Ian and Barbara were later indirectly reunited with The Doctor when Ian was hired by UNIT to serve as a substitute scientific advisor while the Third Doctor was away ("The Face of the Enemy"), where it was revealed that Barbara had gone on to become a university lecturer specialising in Aztec culture. The Seventh Doctor and Ace encountered alternate versions of Ian and Barbara during their brief arrival in an alternate 1963 where the actions of The Valeyard had released the Dark Matrix upon Earth, the alternate Barbara helping The Doctor track down the point where history had diverged before his departure ("Matrix"). In "Death of The Doctor" - an episode of spin-off series The Sarah Jane Adventures, looking at the modern adventures of the Third and Fourth Doctor’s companion Sarah Jane Smith -, Sarah Jane mentioned that her research into other companions had included reference to Ian and Barbara as professors at Cambridge, rumours saying that they hadn’t aged a day since the sixties, although whether this had any basis in fact or merely referred to their still-youthful attitude was unspecified. Not only memorable but also compelling is when Barbara meets a Dalek for the first time, while The Doctor and his companions are investigating an apparently deserted city. As they walk down the bare corridors eyestalks high up on the walls follow their every move. Later, separated from the others, and unknown to Barbara as she proceeds shutters are silently closing behind her. When she reaches a junction she turns only to realise that the path back to the exit is now blocked off. She panics and starts to run down the only remaining corridor. Eventually Barbara reaches a dead end and turns only to find that she is trapped by another shutter closing. As she fights for her breath and tries to calm herself a panel opens and a mechanical arm advances towards her ("The Daleks"). For those watching this story for the first time on VHS or DVD only had a few seconds to wait, and not a whole week, before the next episode started so as to find out what other horrors awaited them.